"A screen capture software that does more than just take pictures." The default screen capturing application on windows isn't that great at all.' It's simple, feature lacking, and an all around dull experience. Yes it gets the job done, but sometimes you need more than that. Have you ever caught yourself wishing that the default screen capture application did a little bit more for you? Of course you have. Trust me; you're not alone. Whether you are taking screenshots to create some sort of tutorial or taking them to be included in a presentation of some sort, Snagit will give you all, I mean all, the tools necessary to get it done. While Snagit can handle the basic tasks of your current windows' snipping tool, it's what the application does beyond that point that really matters. This version of Snagit has full on Google Drive integration, so that you can automatically upload your screenshots to Google drive in order to save time and unnecessary effort. Screenshots not enough? Want things moving a little. Easily capture both still images and video. 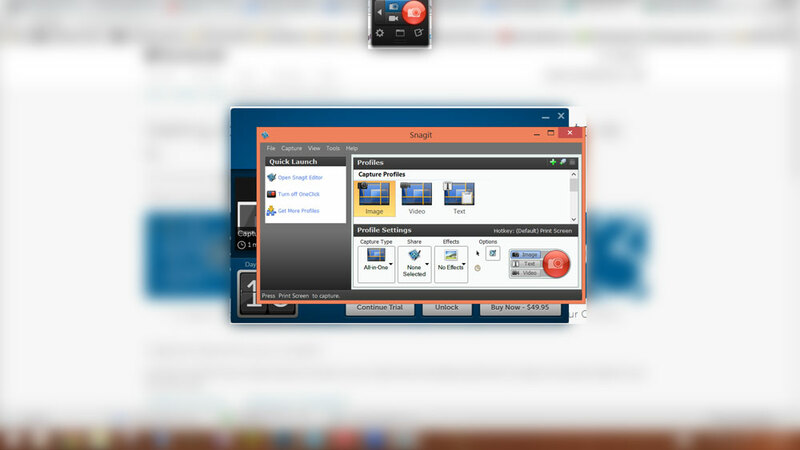 Snagit can record video from your computer screen as well. And you're not left in the dark. Working on a big presentation for work and need a couple of visuals, you can enhance your screenshots and video captures. When everything is all said and done, you can easily upload and share your videos with Youtube, Camtasia studio, Facebook, and/or Twitter. Download Snagit today so you can start making professional tutorial videos and/or work presentations. It is easy use and easy to manage.